6:10 PM — Duff had to shut himself down. He said he experienced a dull pain in his arm, and couldn’t make it through the 25 pitches he was scheduled to throw. He also said he doesn’t expect it to be anything serious. 4:10 PM — Grant Duff threw a simulated inning…he’s tentatively scheduled to come back in three days. Joel Sherman of The New York Post was the first to report that Mark Melancon, as well as Charleston second baseman Jimmy Paredes, were involved in a potential deal that will send Houston Astros first baseman Lance Berkman to the Yankees. 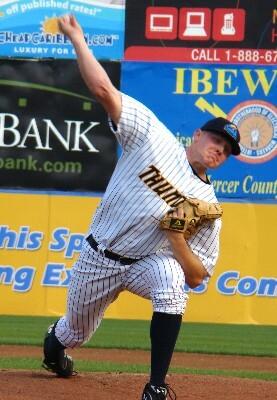 Melancon made his much anticipated and hyped arrival in Trenton in May of 2008 and was every bit as good as he was made out to be. During his two month stay, the imposing righty posted a 6-0 record with a 1.81 ERA in 19 appearances before being called up to Scranton at the end of July. However, despite all of his talent, the 25-year-old could never completely put things together at the big league level, and largely struggled in parts of two seasons in the Bronx. He made all of 15 appearances in a Yankees uniform, including two this season, but was solid for Scranton this season. Tony Franklin, who managed Melancon in Trenton, was surprised to learn the news after the game from reporters. “Not hearing anything previous to what you guys just told me, the thought was, ‘Golly, not Melancon.’ He was so good here,” Franklin said. — I’ll have a game story and an Adams/Sublett/Banuelos/Betances notebook in The Trentonian. Check that out. I’m also now writing for them Sunday as well…so I’ll have no in-game updates Saturday or Sunday. Really, though…you’re either listening to the dynamic duo of Justin Shackil and Jay Burnham or checking out the MILB.com boxscore anyway, so my “ZOMG HE HIT THE BALL SO FAR LOLZ” updates probably aren’t too worthwhile anyway. — Hector Noesi had his second consecutive rough outing today. Had you seen him in the first inning, you never would have predicted it. He threw seven pitches, all strikes, and blew Adam Loewen’s doors off with a three-pitch strikeout to end the frame. In the second inning, however, Shawn Bowman hit a moonshot off of him to left center field that plated two runs, and he escaped further damage after loading the bases later in the inning. So what happened in the second? “There was no difference (between the first and the second). It’s just part of the game,” Noesi said through interpreter and real, live outfielder Edwar Gonzalez. After a 1-2-3 third inning, things completely unraveled in the fourth, and Noesi was ultimately charged with seven runs (all earned) in just 3.1 innings of work. He threw 72 pitches, 48 of them for strikes. “I’m going to try to be extra focused in my next outing and try to come out on top,” Noesi said. — The Thunder outhit the Fisher Cats, 14-13. In the column to the left, however…the one that matters, New Hampshire put up a ten spot, and Trenton only three. The Thunder left 13 men on base (13!!!) and hit into four double plays. “We hit some balls really hard tonight,” Franklin said. — I also have a story on NASCAR Camping World Truck Series driver Ron Hornaday, Jr. in The Trentonian today as well. I…ummm, really have nowhere else to promote that, so yeah. Um. Read up. 3:45 PM — Spoke to Mark Newman for a few minutes…Newman is always gracious with the media, and this was no different. Newman told me — and John Nalbone first reported this — that David Adams has a chip fracture in his foot, something that didn’t come up until a third MRI. “Nobody saw it,” he said. And now, the disappointment for Thunder fans…holding your breath to see Manny Banuelos or Dellin Betances with Trenton this season? Newman says you can exhale. “They’re not going anywhere, they’re staying there,” he said. Newman did not, at this time anyway, anticipate anyone from Tampa joining the Thunder roster for the remainder of the season. 2:45 PM — Not a whole lot going on here just yet. Mark Newman is still here and is out in right field working with some of the pitchers. I hope to speak with him later. Also, the next two days are Trentonian days for me, so I won’t have any in-game updates until Sunday, when Adam Warren takes on Kyle Drabek. Seriously, you can’t miss that one, that’s a stellar matchup. Kudos to yudos, John Nalbone, for finally getting to the bottom of the David Adams mystery. The veteran Thunder scribe reports after speaking to Mark Newman that Adams suffered a previously undetected fracture in his foot and has been shut down. Read John’s blog — which you should be doing anyway — for more. (PR) Trenton, NJ- A pair of extra base hits in the third inning proved to be the difference on Thursday night as the Thunder held on for a 3-1 victory over the New Hampshire Fisher Cats at Waterfront Park. RHP Lance Pendleton picked up his tenth win and Trenton (64-41) moved 2.5 games ahead in first place in the divisional race. Trenton took an early lead against RHP Randy Boone in the third inning. Luis Nunez led off with a triple down the left field line and Justin Snyder drove Nunez in with a double down the right field line for a 1-0 lead. Snyder came around to score on an Austin Krum single to right field, pushing Trenton ahead 2-0. The Thunder picked up some insurance in the bottom of the eighth inning as Austin Romine launched a solo home run to center field giving Trenton a 3-1 lead. Ryan Pope pitched a scoreless ninth to earn his 8th save of the season. (PR) Trenton, NJ- The Thunder pushed three runs across in the bottom of the ninth inning to complete a 3-2 comeback win and a three-game sweep of New Britain on Wednesday afternoon at Waterfront Park. Luis Nunez and Edwar Gonzalez both walked with the bases loaded to score the tying and winning runs as the Thunder (63-41) will remain 1.5 games ahead in first place over New Hampshire. The Trenton surge began with an Austin Romine base hit and a walk to Brandon Laird from RHP Biily Bullock in the ninth. Marcos Vechionacci then tagged a 1-2 pitch to right center for a double to cut the deficit to 2-1. Matt Cusick was then intentionally walked to load the bases for Gonzalez who walked to tie the game at 2-2. Luis Nunez followed and walked on four consecutive pitches scoring the winning run. The Rock Cats scratched across two unearned runs in the fifth inning off DJ Mitchell to take a 2-0 lead. Steve Singleton picked up a base hit, moved to third on an error and scored the first run of the game on a wild pitch. Ben Revere then rolled a triple down the right field line to score Tobais Streich for a 2-0 New Britain lead. DJ Mitchell worked seven innings and allowed just two unearned runs. Mitchell struck out six walked one and scattered six hits in the loss. Cory Arbiso allowed no runs on two hits in the eighth inning. Kevin Whelan (2-3) hurled a scoreless ninth inning and picked up the win. Kyle Gibson, the Twins #3 top rated prospect, tossed six scoreless innings and left with a 2-0 lead. Gibson allowed just four hits with seven strikeouts in the no decision. New Britain RHP Chris Province pitched into the eighth and left with a man on for RHP Bullock (1-3). Bullock struck out consecutive batters to end the eighth inning before he fell apart in the ninth. The Thunder offense was held to seven hits after collecting a combined 25 hits in the first two games of the series. The 3-2 win marks the third time this season the Thunder have won after trailing entering the ninth inning. Trenton opens up a four game series against New Hampshire beginning on Thursday at 7:05. RHP Lance Pendleton will throw for the Thunder against RHP Randy Boone. Tickets are available by contacting the box office at 609-394-3300 or online at http://www.trentonthunder.com. You know information is tight when players are asking me about the status of David Adams. Trenton’s second baseman got off to a hot start in 2010, hitting .309 with 3 home runs and 32 RBI in 39 games, but hasn’t played since May 22nd after suffering a sprained ankle in Portland. Adams had been with the team, but has since returned to Tampa and suffered a somewhat mysterious setback, which nobody seems to have any details on. I asked Thunder manager Tony Franklin directly about Adams’ status yesterday, and he said there is no concrete information regarding the former third round pick out of Virginia. 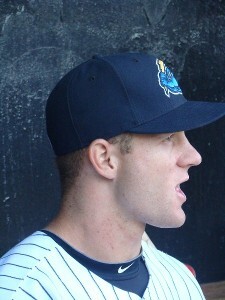 However, I then asked the fourth-year Trenton skipper if he expected the 23-year-old back this season. “As of now, no,” Franklin said.